A friend of mine who has decided to go 'Raw' recently mentioned how she and her husband were only consuming fruit until noon as part of their new eating plan. This is a practice I have read about in a few different books. The basic idea is that fruit should be eaten on an empty stomach. The reason behind the theory is that fruit digests very quickly as it is made up of large amounts of water, fiber and the most basic natural sugars. Unlike more complex carbohydrates and proteins that take time to break down in the body, fruit is considered sort of predigested and only sits in the stomach for a matter of minutes. So why would you want to eat your fruit first and alone? It is believed by some that fruit eaten with or after a meal will sit in the stomach too long and ferment or rot also causing the non-fruit food to do the same. 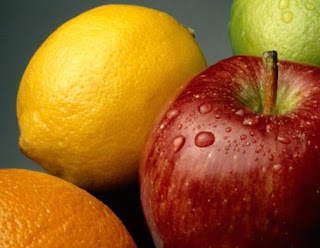 The good news is that even if you don't choose to eat solely fruit until lunchtime or you want fruit at other times of the day, as long as you try to eat your fruit first, before other more difficult-to-digest items, you may only need to wait 5 - 10 minutes before digging into the rest of your meal. Fruit is the best source of the natural sugar needed for energy. Fruit is packed with antioxidants. Fruit contains an abundance of pure water. Fruit contains fiber, necessary for optimum digestion. Some people may be concerned that fruit contains too much sugar. I found this to be an easy-to-understand explanation of how fruit sugars differ from refined sugar. "The body needs natural sugar as a source of energy. When starchy foods such as potatoes and bread are eaten, the digestive enzymes break down complex sugar (starch) into simpler sugars. When fruit is eaten, the body uses the simple sugars (fructose or others) directly, without needing to break them down any further. However, this is not like eating refined sugar. In the case of refined sugar, the food is devoid of nutrients and fiber. Thus, the sugar enters the blood quickly and is not slowed down by the process of digesting fiber. Plus the calories found in sugar are "empty" because the do not provide any vitamins or minerals. Fruit on the other hand, is a nutrient-dense food. Which means that for every calorie it provides, it also gives many micro-nutrients-vitamins and minerals." Find out how 7 specific fruits (apples, bananas, grapefruit, mangos, oranges, strawberries and tomatoes) can benefit your healthy lifestyle here. Remember that fruit is natures 'fast food'. Keep clean, organic if possible, fruit on your counter or in your refridgerator for everyone in your family to grab and go. And don't forget your smoothies. Freeze some peeled bananas in an airtight container and pop one in the blender with some berries, mango, pineapple or orange slices and a little water to make a refreshing drink anytime. I really believe in the concept of fruit for breakfast... It makes such a huge difference for me in terms of weight loss. And it's really no hardship! Of course, smoothies (especially with a bit of green added) is my favorite way of consuming fruit... I always have some frozen bananas and berries in my freezer. Smoothies with greens and fruit is my favorite breakfast!! After reading about this article about eating fruits empty stomach gives the maximum benefit I have also started doing the same.